There’s been a good deal of recent research on the positive effect of exercise to help improve brain health and ward off dementia in adults, but does exercise help the still-developing brains of kids? A recent study showed that it could. While researchers have conducted several short-term associational studies that suggested that taking a walk before a test boosted reading and math performance and that in children with a higher level of aerobic fitness, the part of the brain used for thinking was larger, there hadn’t been a controlled study that explored this topic until now. In a study published in the journal Pediatrics, researchers from the University of Illinois at Urbana-Champaign recruited 200 seven- to nine-year-olds from the local public schools to see what effect regular aerobic exercise would have on their executive functioning skills—the ability to concentrate, multitask and screen out irrelevant information. The researchers divided the children into two groups. One group continued their regular activities while the other came to the university every day after school for a two-hour session of active play that included running games like tag and dribbling and kicking soccer balls. At the start of the study, both groups underwent a series of tests that measured their aerobic fitness and their executive functioning skills. The study spanned the entire school year, though not all the children in the exercise group were able to attend all five exercise sessions each week. At the end of the study period, both the exercise group and the control group of children took the same set of tests that measured aerobic fitness and executive functioning skills. The children who took part in the regular exercise program were moderately more aerobically fit and had lost body fat, while those in the control group did not have any improvement in aerobic fitness. Interestingly, children in the exercise group raised their scores on the cognitive tests significantly, with those who came to the largest number of exercise sessions achieving the greatest improvements. The children in the control group also had higher scores on the cognitive tests, but their score increases were much smaller. The researchers noted that children in this age group usually have a developmental leap in their executive functioning skills, so the children who did not exercise experienced a normal increase in these skills while those in the exercise group showed greater skill development. It’s worth noting that the exercise program in the study did not involve putting kids on a treadmill or having them take part in organized sports. That means you can help your children build both their physical health and improve their cognitive skills by taking them to the playground, going for regular family bike rides or hikes or other fun, active experiences that don’t feel like “exercise”. 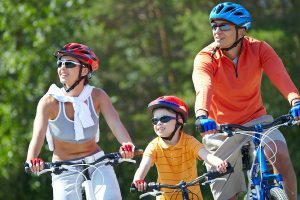 To learn more about how to build a fitness plan that can help your whole family get healthy and active, talk with a health advisor.